VicRoads together with Department of Sustainability and Environment, Transport Accident Commission and Victoria Police are providing a chance for motorcycle riders to attend three briefings and exchange ideas. With the release of Victoria's Road Safety and Transport Strategic Action Plan for Powered Two Wheelers 2009-2013, there is a lot to talk about. Government agencies are making powered two wheelers a higher priority in terms of infrastructure improvements, more focused planning, safety campaigns and access for riders. Hear from experts on these plans and help them better understand how they can help all powered two wheel riders. These informal forums are Free and will run for 3 hours in the evenings. Prior bookings are essential. Attendees will come away with an understanding of the plans for powered two wheelers in Victoria and be able to contribute to a better understanding of the needs of powered two wheeler riders. These sessions are being conducted in the interest of improving communication with Victoria's motorcyclists. All forums will run from 5.30 pm to 8.30 pm. Choose a location and date that suits you. To register go to www.motorcycleforums.com.au or download the PDF Brochure, fill it in and send it back. ‘Demand Safer Roads’: That is the message hundreds of scooter riders will be calling for at the VACC ‘Safe Routes’ Scooter Rally 2009. The 4th annual event will be on Sunday November 8th 2009. Around 400 scooters are expected to take part in the ride from Luna Park to Argyle Square on Lygon Street. The VACC Scooter Rally is the only one of its kind in Australia and entry to this unique event is free. It is always a great spectacle and the VACC ‘Safe Routes’ Scooter Rally is regarded as one of the most colourful events on Melbourne calendar. Well known makes such as Vespa, Lambretta, Burgman and Bolwell will be taking part, many proudly displaying trademark accessories such as multiple mirrors, lights and badges. Moped owners are also invited to ride in this year’s Rally. The riders too like to put on a show. The dress code can range from fish-tail parkers, Fred Perry polos, stove-pipe pants, Doc Marten’s and historic riding gear. One of the most anticipated moments of the day is the now infamous ‘Rally Raffle’ which this year includes a variety of prizes including vouchers, clothing and equipment. “While scooters have a reputation for being fun and trendy, we should not forget they are an important mode of transport. The global economic slowdown has caused some motorists, commuters in particular, to take up scootering because they are cheap to purchase and run, ease congestion, easy to park and good for the environment,” VACC Executive Director, David Purchase, said. “The Victorian Government recently recognised the importance of scooters in ‘Victoria’s Road Safety and Transport Strategic Action Plan for Powered Two Wheelers’. However, VACC, once again, calls on the Government for the implementation of designated and signed ‘Safe Routes’, access by low-powered scooters to use certain designated bicycle lanes, filtering in stationery or slow moving traffic; allowing boxed turns at certain busy intersections; six monthly registrations and dedicated scooter training courses. “VACC also calls for a separate licence for scooter riders. Requiring a full motorcycle licence to ride a scooter is disproportionate and a barrier to entry. VACC puts forward a proposal that there should be a separate licence for scooters under 50cc,” said Mr Purchase. “Additionally, as part of our ongoing Vehicle Safety campaign, VACC urges all scooterists to take Vehicle Safety seriously by ensuring their scooter is regularly serviced and well maintained,” Mr Purchase said. 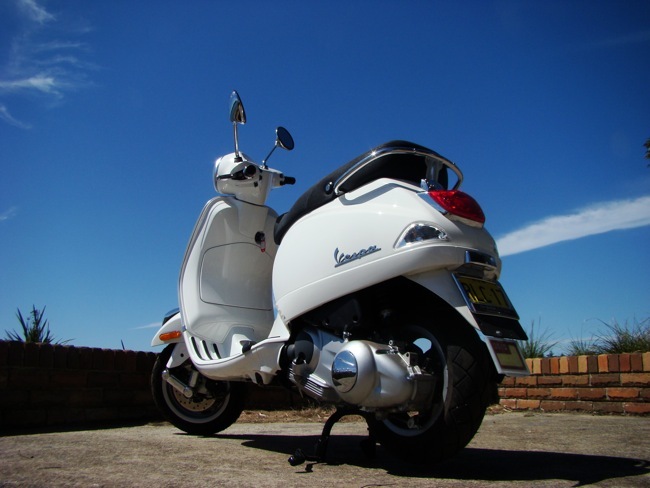 Introducing the SYM Scoota Tasmanian Adventure! I was looking through Scootersales.com.au recently looking for a scoota for my girlfriend and stumbled across an application to accompany the guys from SYM on another one of their crazy rides to test a new scoota in their range. A trip of a lifetime they called it, all I needed to do was send Tim Black (their National Sales Manager) the reason I thought I would be the best candidate. I'd never ridden a scoota, just the R1 and DRZ I had in the garage and a postie bike however, I applied and got a call from Tim asking if I was still interested; why not! Whilst thinking "what the hell am I doing", Tim was assuring me it would be loads of fun, they'd had a ball riding to Cameron's Corner last year on the CityCom300i. I was thinking how nice that would be when Tim dropped the bombshell, pack the thermals, we're heading to Tassie! My first thought summarised the trip, it's the middle of winter, we're insane! Three short weeks later we were packed and heading across Bass Strait to the Apple Isle with the new VS150 and the Classic 125 strapped to the back of the ute. During the trip over on the Spirit of Tassie the SYM boys kept me entertained with tall tales from last year and reassured me that everything would be great fun! Scott (the Service Manager at SYM) came out of the Devonport café with three straws, who was riding and who was driving? Tim and Scott would start us off on the first of some very cold and wet mornings. They raced off out of town as I got comfortable in the ute with the heater on maximum. I quickly realised that scootas had more get up and go than I thought, infact the boys weren't holding back and the scootas held their own with minimum visibility and as it came pouring down. Within half an hour Tassie showed what it is really famous for; corner after corner, hairpins and plenty of flip flop left to rights. The lads were making some decent entry and exit speeds on both scoots in and out of each bend; I was impressed. Three hours into the twists and turns we were all laughing at each opportunity to pull over with stories of sliding scootas on slippery roads and warped rotors on the ute as it tried to keep up coming down mountain roads. We passed through Cradle Mountain and headed in the direction of Waratah for well deserved hot pies and coffee; we'd ridden a quick 230km before lunch! As we refuelled Tim peeled off his wet gear and gave me the nod to get kitted up; I'll be honest I was a bit apprehensive with scootas being so new to me. I jumped on the VS150 and off we went, 40km to Savage River on the west coast. Suddenly my jaw ached, from smiling too much! The VS150 was as much fun as the boys had promised, I felt myself treating it a bit like my road bike and hammered it around the corners just like I'd watched the boys do all morning. The road from Waratah to Savage River is a big thumbs up; it's tight and an exceptionally good surface. Side stands became an early casualty on this section as it was a dry perfect afternoon; what a leap from roadie to scoota aficionado. We awoke on day two a little worse for wear with the news ringing freshly in our ears that it rains 300 days a year on the west coast and we'd been lucky the day before to have ridden a dry patch. We fueled up and headed to Queenstown; quick consumption calculations showed that the VS150 had used 3.73 litres per 100km and the Classic 125 4.12 litres with flat out riding all day - not bad at all. It was a really wet day; foggy visors, wet seats and a freezing body were constants. We didn't do huge day in the saddle however, it was very challenging with uncomfortable weather and scary road conditions; water running across sometimes two inches deep and blind corners. Scott kept the little red Classic 125 pinned through everything and it handled it with gusto. The scootas did not miss a beat all day and comfort wasn't too bad considering how arctic it was although Queenstown couldn't arrive quickly enough. We were greeted by an open fireplace and warm locals who were intrigued by our adventure. Day three started off with a three tired riders, a lost key and soggy gear however, the scootas were raring to go! Tim and I geared up and started a huge ride to Strahan, about 280km in the direction of Reece Dam. This is often described as the ultimate corner section of Tassie; I was really excited and hoping it might dry up a little for us to make the most of it. Tim and I got into Strahan with Scott and the ute not in sight; there'd been some tight corners coming into town and we were a bit worried about the last 40km's especially. A short 15 minutes later Scott arrives only to sheepishly confess that he'd made himself car sick twice on all the corners trying to keep up with the scootas! Again we were off, getting the 150cc engines working hard hitting and braking into each corner; racing each other from one to the next, great fun! The bigger brakes on the VS150 had the edge making late entry a breeze. There was only one incident in the whole trip. Tim decided to park the VS150 on a hill to take a photo, unfortunately it was a little precarious and rolled off its stand into some boulders. To my amazement Tim picked it up, hit the start button and rode off; with a couple of scratches and a bent lever there was hardly any damage, if that had been my motorcycle I'd be calling the assessor! The afternoon actually allowed us to appreciate the state's serenity, it's like nothing I've seen on the mainland. Lush green fields, endless mountains, rivers that are gushing with water, you could wear out a camera there. Towards the end of the day we were worn out, physically and mentally. Our concentration levels had been exhausted early in the day with all the twists and turns so it was a relief to be back in Queenstown for another night. The fuel consumption was still consistent from the previous day with the spare change from yesterday keeping us going all day! A bit of a late start on day four due to local hospitality however, a punishing 300km to Hobart was on the agenda. Tailing in the ute I watched as the VS150 was hitting 108km/h on the flat (most of Tassie's roads are 110km/h); pretty impressive. When we hit a good section of corners the ute was hard pressed to keep the scootas in sight. Tassie's conditions were varied; some snow, consistently wet roads, the occasional glimpse of sunshine (and dry road for a bit of fun) and the ever-present grey nomads chugging along at 70km/h enjoying their retirement. Getting the VS150 into the slip stream and overtaking didn't take too long and was very impressive considering 200 odd kilograms of rider and scoota and only 9kw of power! Scott and Tim gave the scootas a good going over at the start of day five; just a quick adjustment of the Classic 125's rear brake and we geared up ready to go. I had forgotten what traffic looked like until we hit the hustle and bustle of Hobart's peak hour. The scoota's really came into their own showing off how nimble they are in traffic and although we'd had great fun on the open road, it became really obvious where they felt most at home. We left Scott behind in the ute struggling through the traffic as the scootas boasted their flexibility manoeuvring through the congestion with ease. My opinion of scootas has changed forever; what a great way to commute! Out of the city and up the east coast with spectacular coastal views, it felt like northern NSW. The weather had been crazy with 80-100km/h head and cross winds, the scootas just kept going through it all and maintaining consistent fuel economy. Late in the afternoon the rain got so heavy that we were forced to call it a day at Scottsdale; visibility had been reduced to just 10 metres and gravel was appearing on every corner. At the end of day five the VS150 had travelled 1,400km and was still averaging 3.96 litres per 100km. The last day was fairly low key, a leisurely zig-zagging the 300km through towns the long way to Devonport. As I was riding along I realised that I'd only been overtaken twice and how surprised I was, mainly due to my misconceptions about scootas. We'd had a great tour of Tassie, been able to appreciate the beauty of the state, not been a mad rush however, we'd absolutely kept up with traffic and held our own. As we all gathered to climb on board and cross back to the mainland I was a little sad the adventure was over and was happy to admit how much fun I'd had. 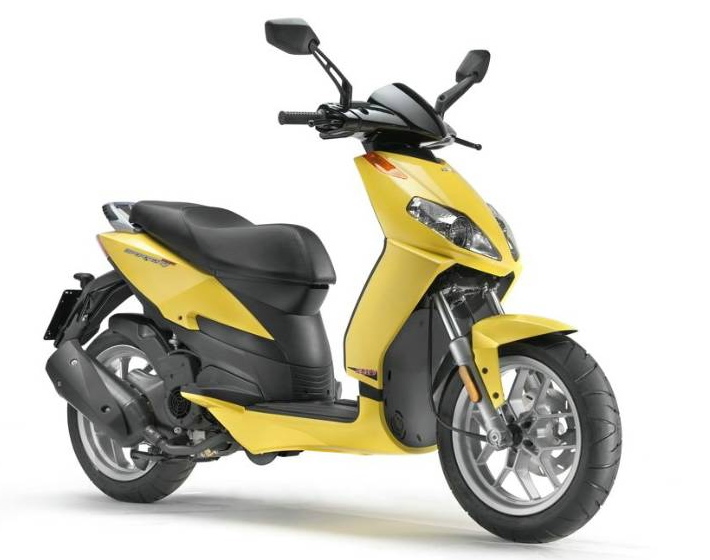 I'm set to add another set of wheels to the garage fleet and yes, it's going to be an SYM scoota. I'm chuffed to have been given this opportunity from the crew at SYM, it was a hard ride but they were right, bloody good fun! I highly recommend having a ride on anything that's thrown your way, even a scoot, you may just be surprised, I was! 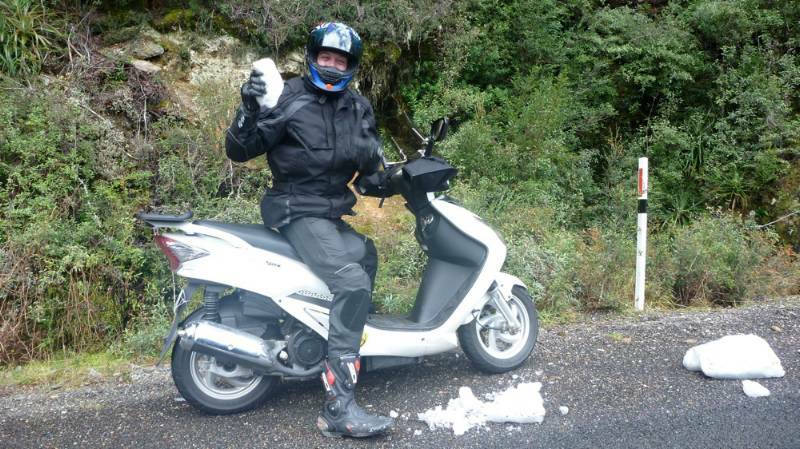 Filed under: Introducing the SYM Scoota Tasmanian Adventure! FCAI release sales figures on all two wheeled vehicles up until the end of September 2009. Figures released by the Federal Chamber of Automotive Industries (FCAI) show 82,601 motorcycles, scooters and all-terrain vehicles (ATVs) were sold in the nine months to September – a 14.4 per cent decline compared to the same period in 2008. “The motorcycle market has faced a period of challenging economic circumstances and although down on the record highs of last year has remained resilient,” FCAI Chief Executive Andrew McKellar said. “It is encouraging to see that some brands have managed to record increases on last year,” he said. (e.g. BMW, Husqvana, BRP and Triumph). “While these positive achievements provide grounds for optimism, some areas of buyer confidence remain fragile,” Mr McKellar said. “The industry would caution against any further interest rate rises and urge those contemplating buying a new motorcycle to take advantage of the current low rates,” Mr McKellar said. ATV sales were broadly in line with the results of 2008 with 14,202 units sold – down just 2.3 per cent on last year. “It appears the business tax break has encouraged many to undertake new investment however, with this policy measure ending on 31 December people should move quickly to take advantage of it,” he said. Road-bikes were the most popular segment in the market recording 30,984 sales (14.5 per cent decrease) closely followed by the off-road segment’s 29,615 sales (12.6 per cent decrease). Scooter sales fell 33.9 per cent in the first three-quarters of the year, recording 7,800 sales compared to the record 2008 result. Yamaha was the overall market leader with 18,019 sales, followed by Honda with 17,949 and then Suzuki with 11,568. RoadSafe Melbourne Eastern Ranges in partnership with Victoria Police, the Shire of Yarra Ranges, and Honda Australia Rider Training (HART) is holding a Motorcycle Safety Day at the Reefton Junction, Woods Point Road in Reefton. The event will take place on Saturday 24 October 2009 from 10am to 3pm. Participants can look forward to receiving information on motorcycle safety, including free advice on motorcycle maintenance, rider training and safety gear. Victoria Police will be in attendance on both marked and unmarked police motorcycles and will be available to discuss rider safety issues and provide information on hoon legislation. There will be a sausage sizzle and participants will be eligible to win $100 and $50 riding gear vouchers provided by the Shire of Yarra Ranges, a Dri Rider riding jacket, and a HART rider training voucher to the value of $200 as part of the raffle prize draw. Chairperson, RoadSafe Melbourne Eastern Ranges, Mark McGuire said, "The Black and Reefton Spurs are acknowledged as one of the most popular areas for motorcyclists in the state. Approximately 70% of riding in the area occurs over the drier months from October to March. We chose to host the Motorcycle Day at the Reefton Junction in October for these reasons". Senior Sergeant Steve Rosewarne said, "During 2008/09, one fatal motorcycle crash resulting in two fatalities and 24 serious injury motorcycle crashes occurred in and around the Black and Reefton Spurs. The Yarra Ranges has the second highest number of casualty crashes for motorcycle riders in the state". "The main causes of motorcycle crashes are ones in which the motorcyclist has ridden off the road. Possible causes for these crashes are new inexperienced riders, returning riders unfamiliar with the area or motorcycle, riders using these areas as a form of a time trial and/or riders suffering fatigue from a long ride", he said. RoadSafe Melbourne Eastern Ranges, in conjunction with State and Local Governments, works with the local community and local businesses to implement road safety programs that reduce the road toll. The Motorcycle Safety Day is just one example of the positive impact that RoadSafe has in the community and all motorcyclists are welcome to attend this unique event. BRP introduces the new Can-Am Spyder RT roadster in response to specific consumer demand for a touring platform. 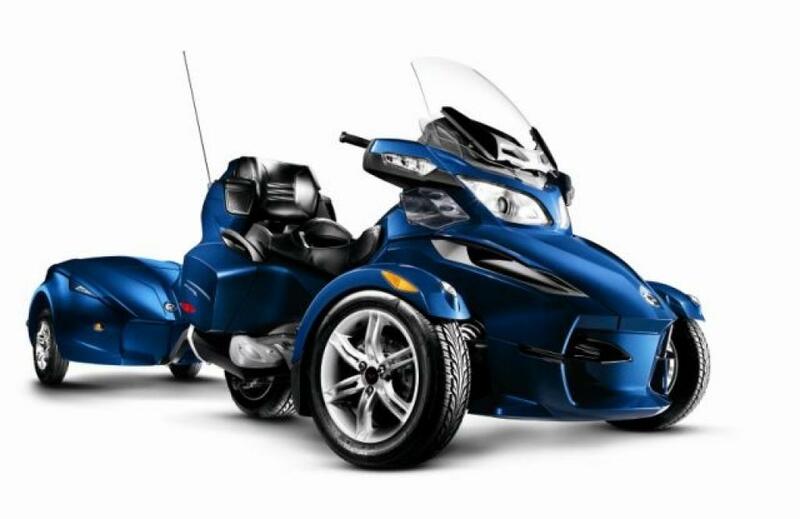 The 2010 Can-Am Spyder Roadster line-up now includes the Spyder RS (Roadster Sport) and RT (Roadster Touring) models. The introduction of a touring model coincides with a substantial gain in market presence on the heels of strong consumer demand since the roadster's launch 2 years ago. Driven by a passionate owner community, the innovative three-wheel concept has become a global phenomenon in more than 50 countries to-date. "The Can-Am Spyder RS is already a resounding market success, although, clearly, its full growth potential is only beginning to materialise," said Australian and New Zealand Can-Am Spyder Product Manager Rohan Slater. "We are delivering the expansion of our Can-Am Spyder roadster line-up as promised at its launch in 2007 and believe the announcement of the Spyder RT will further accelerate the momentum experienced thus far." 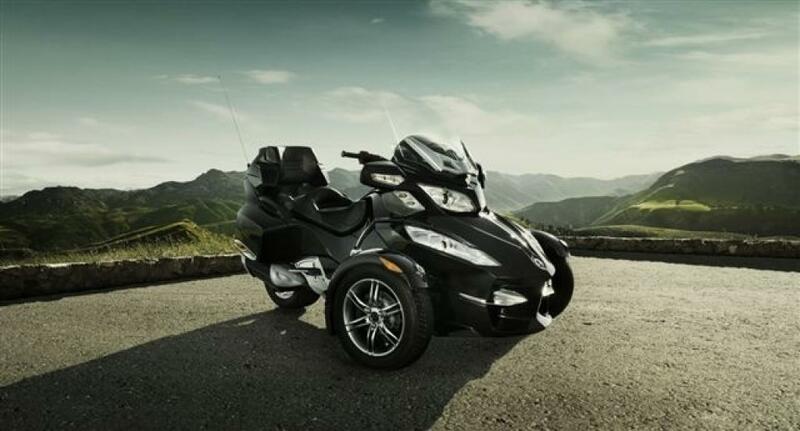 The Can-Am Spyder RT roadster powered by a Rotax 991 engine with Electronic Throttle Control optimized for touring stays true to the brand's promise to deliver a perfect balance of performance and peace of mind. The roadster features the same acclaimed BOSCH-engineered Vehicle Stability System (VSS) as found in the Spyder RS roadster, which includes Anti-lock Brakes, Traction Control and Stability Control systems. The VSS, coupled with the inherent stability of the roadster's 'Y-architecture' and overall ease of use reinvents riding for enthusiasts of all skill levels. BRP is also introducing an industry-first optional RT622 trailer package*, designed specifically for the Spyder RT roadster, which is compatible with the vehicle's stability system and provides an additional 622 litres (22 cu. ft) of storage. "The introduction of the Can-Am Spyder RT now provides options for sport and touring enthusiasts alike," said Chris Dawson, Vice-President and General Manager, BRP International Division. "BRP's superior design and innovation continues to deliver paradigm-shifting vehicles that push the envelope and the RT model is no exception. The new platform goes brilliantly with what touring riders demand and there is no doubt in my mind the Can-Am Spyder RT is going to forever change the touring motorcycle category." The Spyder RT roadster will be available for trial at authorized BRP dealerships in Australia and New Zealand from early 2010. Consumers have the option to pre-order from the limited quantity arriving early 2010. Bombardier Recreational Products (BRP), a privately-held company, is a world leader in the design, development, manufacturing, distribution and marketing of motorized recreational vehicles. Its portfolio of brands and products includes: Ski-Doo and Lynx snowmobiles, Sea-Doo watercraft and sport boats, Evinrude and Johnson outboard engines, direct injection technologies such as E-TEC, Can-Am all-terrain vehicles and roadsters, as well as Rotax engines and karts. With manufacturing facilities on three continents, BRP products are distributed in more than 80 countries. Sea-Doo, Ski-Doo, Lynx, Evinrude, Johnson, Can-Am, Rotax, E-TEC, Spyder and the BRP logo are trademarks of Bombardier Recreational Products Inc. or its affiliates. All other trademarks are the property of their respective owners. *Certain options may not be available or homologated in Australia and New Zealand. Here is our new LX Commercial that we shot around the bay areas in the inner west of Sydney. Thanks to Craig at My-Scooter who did the riding and supplied the scooter. Also found vespa official video on the new LX 40 4t and LX 125 injected. Close to 100 accessory, apparel, safety gear and moto service and experience exhibitors will be bringing their biggest and best deals to the 2009 Sydney Motorcycle Show when doors open in a month's time. The largest event of its kind in Australia, the November 20-22 show at Sydney Olympic Park will be a one-stop shop for enthusiasts regardless of the type of bike they choose to ride. Visitors in the market for some new gear at exceptional prices are sure to make their way to the big brand motorcycle accessory and apparel clearance sale which will discount close to a million dollars worth of product over three days. Organisers introduced the sale in 2008 after feedback suggested visitors wanted to both browse and buy when attending the event. Unprecedented discounts resulted in an incredible response from visitors who snapped up bargains on helmets, jackets, boots, gloves and other road and off-road gear alongside a variety of apparel. Brands including Dainese, Shift, Fox, Ixon, Shark, Alpinestars, RG Sport and Rivet will be on sale again with the chance for visitors to save up to and over 50% on regular prices. Specials will include summer jackets from $99 (reduced from $299.95) and leather gloves from $30 (reduced from $69.95). Event Manager Mark Petersen expected exhibitor display sales and the clearance area to be a hive of activity at the 2009 show. "The event is the best opportunity for people in the market to see and buy the latest in motorcycles and motorcycle-related products and services being showcased under one roof, plus there is also the opportunity to buy aftermarket products and apparel clearance stock at reduced prices theoughout the show, said Petersen. The accessory clearance area proved to be very popular with visitors last year and weâ€™re pleased to announce it will return again in 2009 with the biggest brands and range on offer at incredible prices. Our visitors told us they wanted the opportunity to update their riding gear and the diversity of exhibitors means there will be something here for everyone. We are committed to providing the very best value to visitors; for one low admission price visitors can check out hundreds of the markets newest motorcycles and a range of quality accessory and service exhibitors. In addition there are up to five daily shows in the Yamaha Action Arena featuring the best stunt, freestyle motocross, mini bike and trials riders the country has to offer, plus a host of special guests to meet and various giveaways. 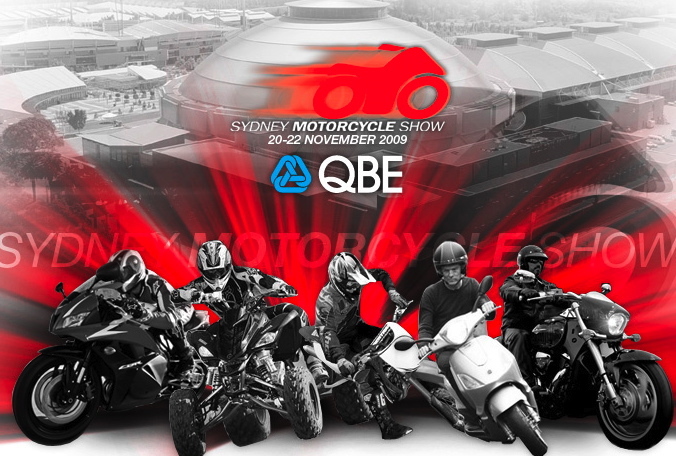 The Sydney Motorcycle Show is a family-friendly event and offers something for all ages and levels of rider experience. Tickets start at $13 and the best value option is the family pass (2 adults and 2 children) for just $46. For further event and ticketing details visit www.sydneymotorcycleshow.com.au. Aprilia Australia have revised pricing down across a range of key scooter models. 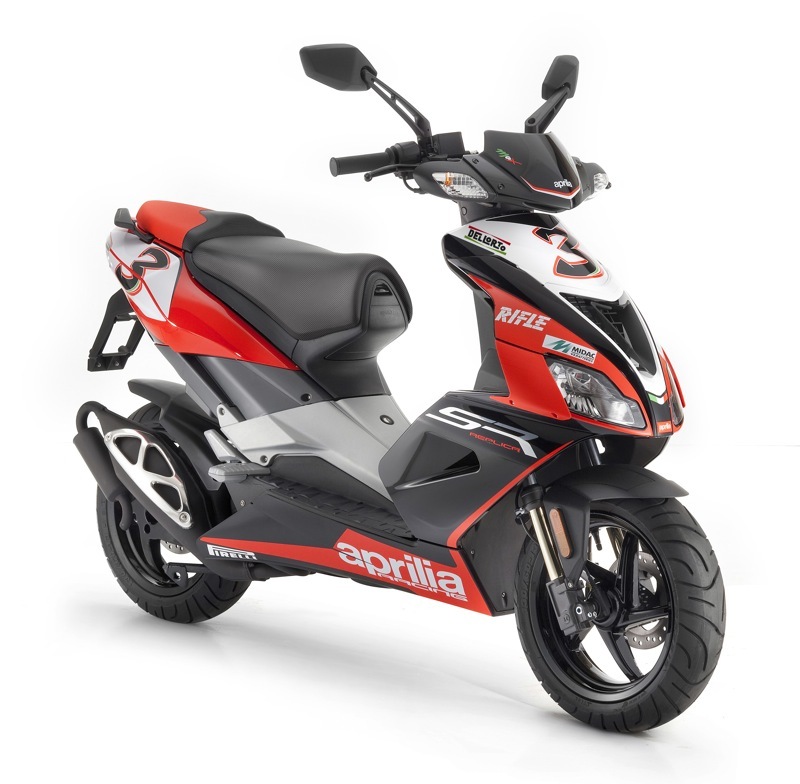 Below is an updated price listing of the entire Aprilia Scooter Range. The sleeper in the pack would have to be the Sportcity 300 Cube, an amazing scooter for just $6,990 + ORC. 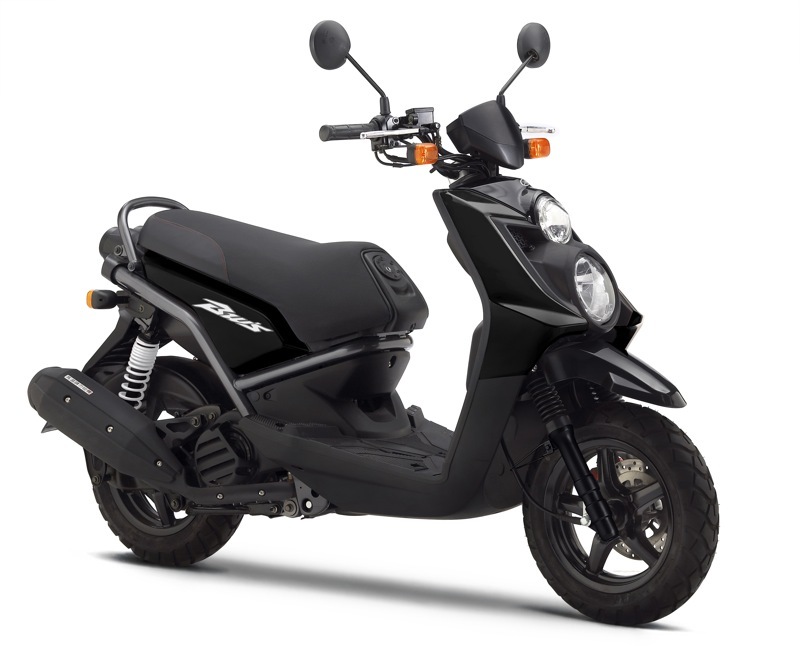 New for 2010, the BW’s 125 ensures that even on the longest, hardest runs, commuting doesn’t have to be a chore. 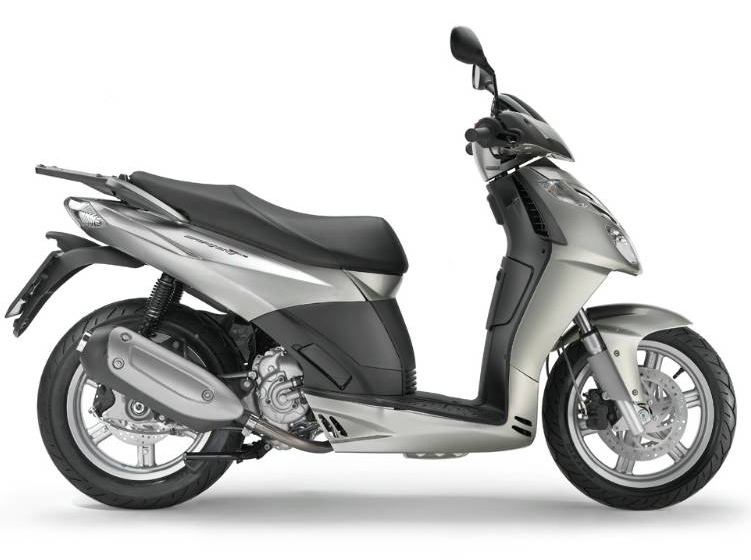 Agile and responsive, this uniquely styled and attitude-filled BW’s-series scooter offers a 125cc, 4-stroke, fuel injected air-cooled engine – giving you the power and punch necessary to negotiate the trickiest traffic. The agile BW’s 125 tackles whatever the day throws at you: from tight, twisting back roads to busy urban high streets. Big, wide, all-terrain style 12inch tyres ensure you maintain a great connection with the road, whether it’s a cobbled street or a wet gravel path. Great levels of balance, grip and ride comfort mean you can easily handle any weather and conditions. Off-road grade dual rear shock absorbers take you smoothly over any potholes the city serves up. The heavy-duty frame is built to withstand the demands of a daily commute in rush-hour traffic, and is matched with an extra-wide handlebar for great control and flexibility, making it easier to negotiate jams. 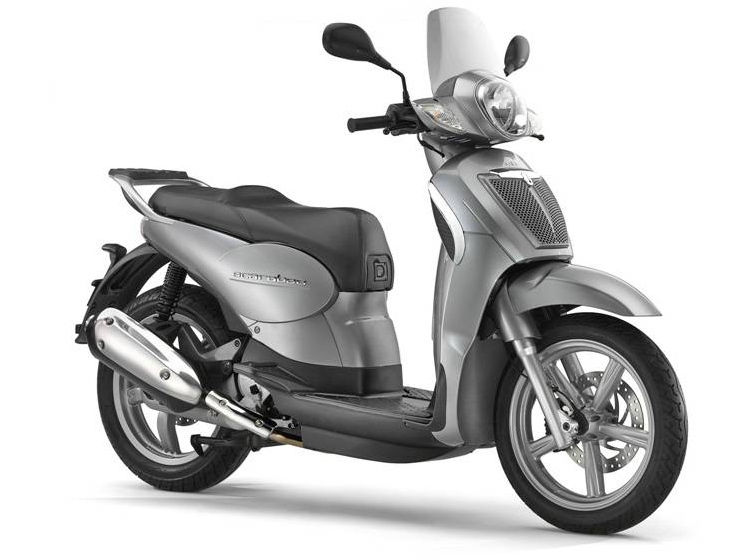 A short wheelbase makes the BW’s 125 exceptionally agile and simple to manoeuvre in tight city streets. The masculine, rugged, good looks of the new BW’s 125 – complete with heavy-duty exposed frame, dynamic dual headlights, striking graphics and a specially-designed logo – are the ideal complement to city living, whether commuting to work or enjoying a weekend ride with friends. Extra design touches include an artfully designed instrument panel, which gives you vital machine information at a glance, and ample underseat storage for a full-face helmet. The BW’s 125 has the power and performance to back up its rugged, urban looks. The 125cc, 4-stroke, fuel injected, air-cooled engine offers immediate acceleration whenever you turn the throttle, ensuring you have the power to overtake safely and pull away from the lights with confidence. Combined with the grippy tyres and easy handling, it creates the kind of riding character that was made for cities. Designed to be shared, the BW’s 125 features a comfortable pillion seat for two-up riding. The power of the 125cc engine – plus the easy handling offered by the extra wide handlebars, short wheelbase, grippy tyres and off-road grade dual rear shock absorbers - mean that even with a passenger on the back, your journey will be smooth and simple. And on top of this, Yamaha’s renowned engineering know-how keeps maintenance down to a minimum. You can trust the BW’s 125 to take you anywhere you want to go – always looking good, and always on time. 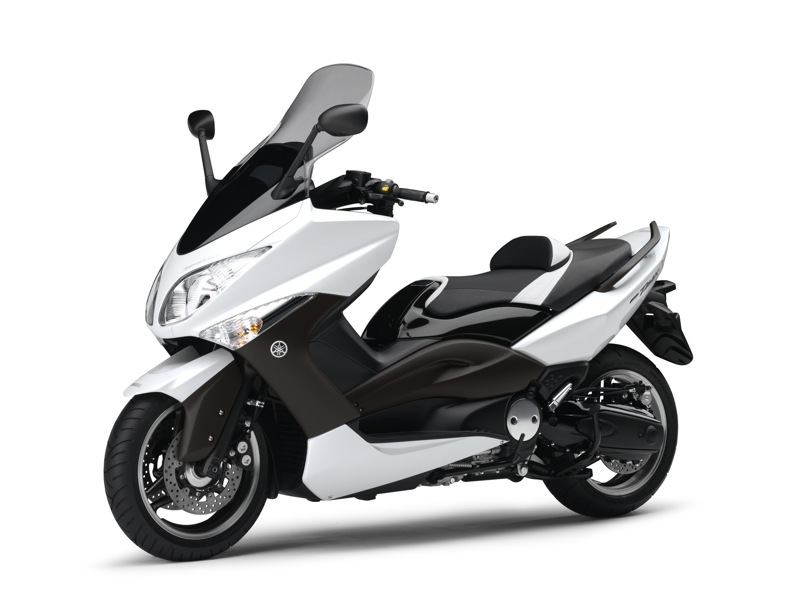 The BW’s 125 is available in Avalanche White and Midnight Black. In 2000, the first TMAX revolutionised the scooter market. By combining the low centre of mass that makes a scooter so easy to ride with the performance, handling and road presence of a sports touring motorcycle, Yamaha created a unique vehicle – as happy on the highway as it is on busy city streets. It went on to achieve unrivalled popularity throughout Europe. To celebrate the 10th anniversary of this landmark in scooter design, Yamaha is proud to unveil the new TMAX WHITE MAX. Combining unique, special edition styling with the same performance and power that have made the TMAX a market leader for the last ten years, this is a very special machine. A striking, one-off white colour scheme accentuates the dynamic, sporty lines of the TMAX WHITE MAX, making a dramatic statement as you glide past in sharp, aerodynamic style. Special edition graphics and luxurious anodised metal parts lend the TMAX WHITE MAX an individual look, completed by a distinctive two-tone seat design and polished titanium-coloured rims with bronze centres. The styling continues on the inside of the TMAX’s sculpted cockpit area, with white illuminated meters that sit perfectly with the unmistakable TMAX bodywork. The trademark ‘twin eye’ headlight arrangement and sharp rear light cluster ensure the TMAX WHITE MAX looks as impressive in a rear view mirror as it does accelerating into the distance. A high windshield and aerodynamic bodywork offer excellent weather protection, keeping the elements at bay. At the rear, the exhaust muffler is positioned high, in true sportsbike style, and emits a throaty growl. The TMAX WHITE MAX’s sports bike performance is the result of its exceptional engine design. The horizontally-mounted, liquid-cooled, 4-stroke, DOHC, 4-valve, parallel twin-cylinder 499cc engine offers the responsiveness to accelerate in the city, and is just as comfortable with long cruises out of town. Providing 43.5PS of power and 46.4 Nm of torque, there is great acceleration from standstill as well as at medium speeds. 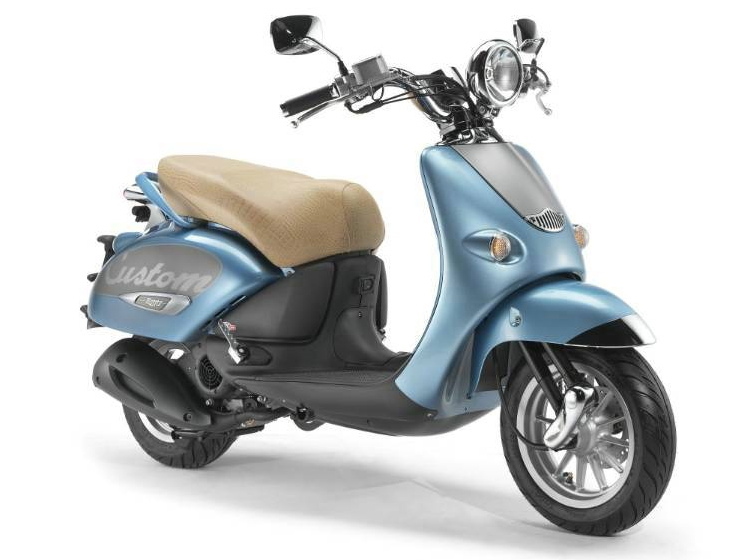 And with smooth automatic V-Belt transmission, it’s as easy to ride as any scooter. Key to the TMAX WHITE MAX’s motorcycle-like handling is its exceptional frame design and engine position, which deliver handling unlike any other scooter. Constructed from a mix of extruded and cast aluminium sections, using Yamaha’s exclusive CF die-casting technology, the TMAX WHITE MAX’s chassis has an ideal rigidity balance that delivers excellent, motorcycle-like handling and stability while minimising weight. The wheels and suspension of the TMAX WHITE MAX ensure great handling and superb rider comfort. The large, 15inch wheels provide great stability and a quick steering response, while sturdy 43mm diameter front forks keep the front wheel tracking straight over poor surfaces. Strong rear shocks provide brilliant damping over bumps and irregularities in the road. For an extra feeling of security, the TMAX WHITE MAX features a powerful 267mm rear disc brake and a 267mm, double-disc front brake with the same four-pot mono block brake calipers used in Yamaha sports and touring motorcycles. The result is smooth, strong stopping power at any speed. The TMAX WHITE MAX is also available with ABS brakes for improved stopping in exceptionally bad weather conditions. For longer trips, two glove compartments provide generous and easily accessible storage – including a cardholder for items such as toll tickets. Additionally, the large underseat compartment – which opens to the rear for easy access – is hinged on gas struts like a car boot. And since it’s illuminated, it’s simple to find your belongings in the dark. Lucky TMAX WHITE MAX passengers will enjoy the ride too. The large, luxurious sculpted seat, fold-out foot rests and sturdy grab rails make riding two-up a pleasure, and the TMAX WHITE MAX’s power and torque mean it won’t struggle with additional weight. A large, 15-litre capacity fuel tank makes the TMAX WHITE MAX an ideal distance tourer, suitable for long rides and weekends away. All in all, this is a very special edition of a very special scooter. The TMAX WHITE MAX is only available in Competition White. • Dual 267mm discs at front with four-piston front callipers and single 267mm disc at rear for secure stopping. The 2010 models that will rule roads and dominate dirt tracks throughout the country will be showcased under one roof at the Sydney Motorcycle Show at the Sydney Showgrounds next month. In excess of 400 new motorcycles will line exhibits of over 16 of the world’s most renowned manufacturers when doors to the November 20-22 event open. Brands on show will include Honda, Suzuki, Yamaha, Kawasaki, BMW Motorrad, KTM, Ducati, Triumph, Hyosung, Piaggio, Vespa, Gilera, Victory, Harley-Davidson, MV Agusta, Husqvarna, plus more. The event provides enthusiasts an exclusive opportunity to compare features and functionality under one roof, with expert advice on hand from manufacturer representatives. “Buying a first or upgrading an existing motorcycle is based on an informed choice,” said Event Manager Mark Petersen. “The Sydney Motorcycle Show caters to all budgets and offers the biggest variety of bikes from renowned and trusted brands the world over, all on one showroom floor for simple comparison. In total, over 120 exhibitors are confirmed to participate in the Sydney Motorcycle Show, with product and service providers set to compliment the range of new bikes. Inclusive of event entry admission are a number of attractions which are sure to thrill showgoers of all ages. The Yamaha Action Arena will come alive with up to five daily shows featuring the country’s leading freestyle motocross and street bike stunt riders, plus mini motocross and trials displays. Special guests, giveaways and show specials round out a value-packed event, with tickets starting at just $13 for children. We take a ride on the new LX injected range from Vespa. When Vespa updates a model you certainly don’t think about the iconic Italian progressing in leaps and bounds. More of a steady progression- evolution even. A styling accent here, a rich new colour there. So my thoughts before riding the new LX was one of just that, steady progression or evolution of the species. A few styling cues head the list of changes for the new injected LX range and these include some nice touches of chrome in key areas, most noticeable being the front horn cover. Not a major lashing of the shiny stuff, just a finessing of the design that is as timeless as scooters could possibly be. The one piece, monocoque chassis remains- the uniquely constructed body ensuring a rigid, solid feel on the road. This is something that only Vespa can offer, and is one of the key attributes that sets the magic brand apart from the rest. Storage also remains the same as the previous LX range with a removable seat bucket and key operated glove box. Same old same old, but just how we love it. Pure Vespa. And of course, it comes with a full hundred weight of style, ceremony and romance. Armani on wheels. The dash sees a small change with blinkers and warning lights being laid out in a revised pattern with the introduction of a engine warning light which is the first tell-tale that the new model is sporting some electronics. But again, the dash changes are nothing huge simply the refinement you would expect from a mid-life model upgrade. Looking at it on the showroom floor, these changes are a mild tweaking it seems- a spruce up, or a polishing of the boots. Until that is, you start the scooter and head out onto the road. The moment you sit on the new LX i.e. you immediately feel the additional comfort from the reshaped and padded seat and thicker handgrips. Hit a bump on the road and the seat remains plush with the feeling you’re sitting in a custom saddle rather than on top of the park bench some scooters call a seat. Huge improvement No 1. Both engines offer enough power to tackle daily tasks with ease- whether it’s the mundane commute to the office or a social run. 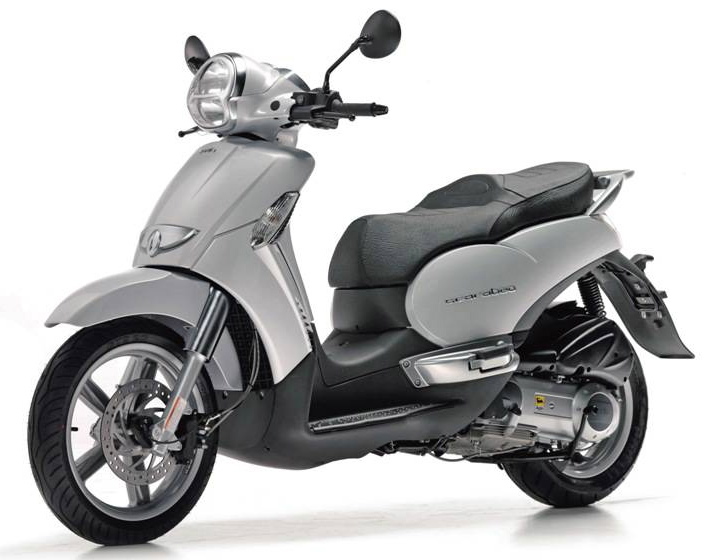 The 125 injected engine is shared with the ‘LX-S’ model as well and is more than capable of propelling the metal bodied Vespa forward at a rapid rate. In my honest opinion those looking for a gutsy daily performer, needn’t look past the 150 cc version. The LX 150 i.e. will deliver in any situation including comfortably being able to tackle short motorway runs. Something the carby version was able to do, but the injected version does it so much easier, so much more precise with a surprising amount of speed. You can get caught out as the engine accelerates so quickly now that speedo checks are a mandatory procedure. All the handling traits that existed on the 1st generation LX remain. That solid feel from the all metal body that only Vespa can give. It’s like the difference between a weatherboard home and a double brick home- they’re both nice, but you really know when you’re sitting in a double brick house. That ubiquitous single sided front end that has stood the test of time has a different side cover on the ‘S’ version- exposing more of the bright red shock spring for that sportier look. Reassuring, flex free riding with sharp responsive handling- still a hallmark of the injected range. It’s just that it all happens now, so much faster and so much smoother than before. Storage in the form of the underseat bucket, glovebox and bag hook easily cater for most events. Sure you can accessorise up to a top box if required, but you probably won’t be wanting for more space. The glove box is such a handy spot for stashing your small items like wallet and phone, and even for hiding the rain pants you often carry ‘just in case’. 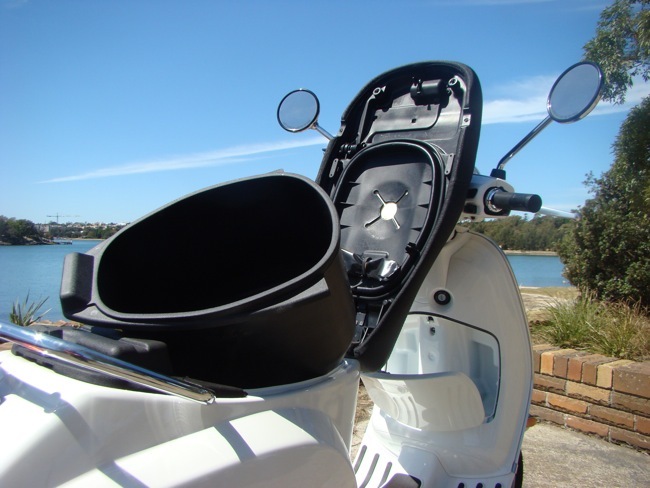 I love the ‘uniquely Vespa’ pull out underseat bucket too, as it’s so easy to clean out all that gunk that only seems to accumulate under your scooter seat. And it also gives you quick and easy access to the engine- not that there’s anything for you to do, but it’s like popping the bonnet on a car so all the guys can stand around and look at it- a very important bonding process. Some people may say that Vespa's upgrade of the LX range is just a simple and gradual transition, and on the surface, it might be. But for me it’s much more than that. It really is the next generation as I feel the leap forward is that extensive- smoother, better, faster, more economical, more comfortable. It’s almost inappropriate to say- but ride it and I am sure you will agree that anything you may have found lacking in previous models has now been addressed. Inappropriate, because the previous incarnation of the Vespa LX was such a capable scoot, head and shoulders above the other players, and yet they’ve made it better and cheaper with Vespa Australia having revised the pricing down. The range kicks off at $5690 for the 125 and $5990 for the 150 cc version (plus ORC). If you’re a car buff, it’s a bit like the Porsche 911- always had the engine in the ‘wrong’ spot, yet love it or hate it, it’s the best sports car money can buy, hands down. And just when the latest 911 was being hailed as the best ever drivers car, they make it better. Maybe we should call this Vespa the 911LX- the epitome or pinnacle of classic scooter engineering. Next generation, Lower pricing, a true update in every sense. That familiar Vespa feeling you get with every ride remains, the look and feel is unique and something that only owing one will describe. They took a great thing, and made it better. I wonder where they will go from here. Filed under: Vespa LX 125/150 i.e. 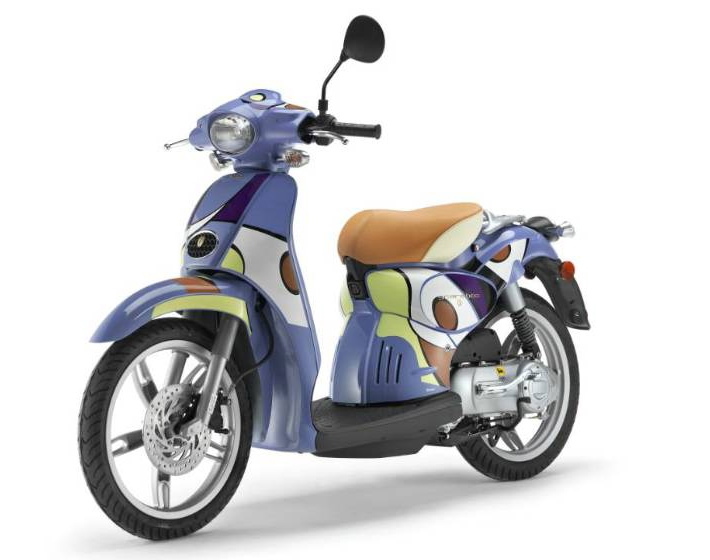 First introduced in 2005, GTS 250 has been an instant hit creating a frenzy of interest in the scooter world, while recently eclipsing the highly popular GT 200 in total sales. Piaggios continuation of GTS 250 will come as good news, and no surprise, to owners of the ultra reliable quarter litre model, a large number of which are now heading to the 30,000 klm zone. 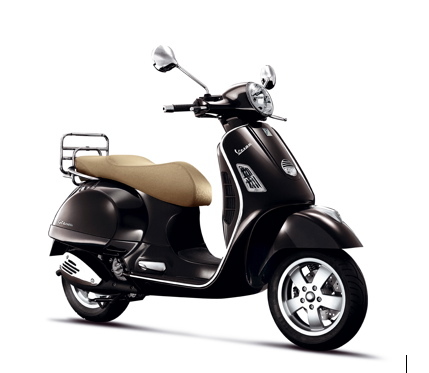 The all steel body Vespa strides ahead of competitors and underscores the value of initial purchase. 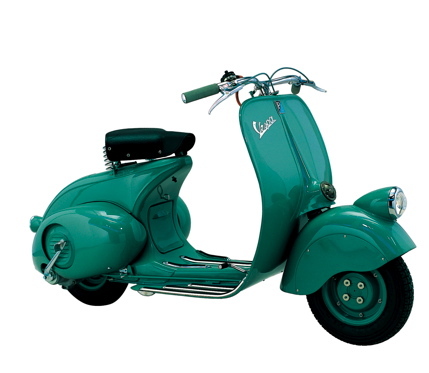 The heritage of this longevity is proven by the number of vintage Vespa models dating back to the original 46’, which are still on the road today. 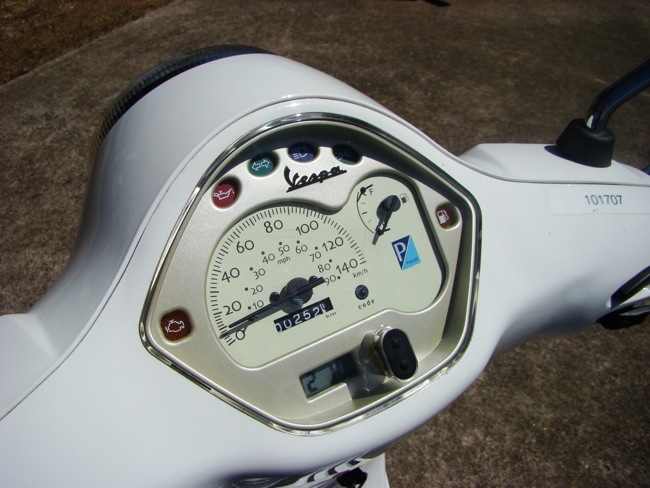 The heart of the GTS, the ultra reliable water cooled, fuel injected 250cc Quasar engine, widely acknowledged as the best 250 class motor in the scooter market today, has propelled the classic Vespa design into the modern era and beyond. The excellent fuel economy of the 250 in particular and the ability to comfortably travel at freeway speeds has enamoured the GTS 250 to commuters. The extra carrying capacity of the standard rear rack also highlights the model as an excellent all rounder. Buyers can currently save $500 of the normal MLP $8490 price. Filed under: Vespa GTS 250 i.e. In just two decades Aprilia has managed to become a motorcycle racing legend with 33 World Championships and over 300 Victories, such success makes them Italy's most successful brand in existence. 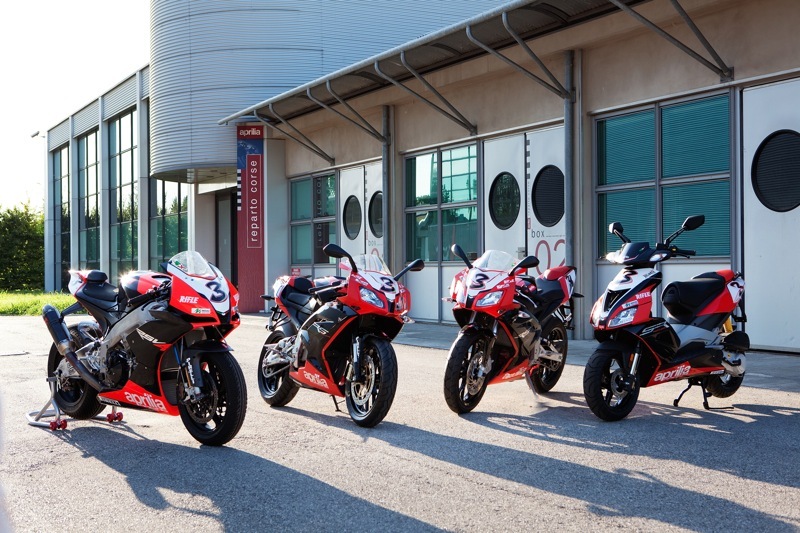 2009 marks the return of Aprilia in the World Superbike Championship and with Max Biaggi’s recent victory in Brno on board the newly released Aprilia RSV4 Factory, Aprilia are proving once again that they are a force to be reckoned with. To celebrate Max Biaggi’s first victory onboard the Aprilia RSV4 Factory, Aprilia have released a RS125 SBK Limited Edition and SR50R SBK Limited Edition. Both models will feature the same livery as the extraordinary Aprilia RSV4F Superbike that has taken the world by storm with its advanced technology and incredible performance. Only fifty units of each model will be imported into Australia. 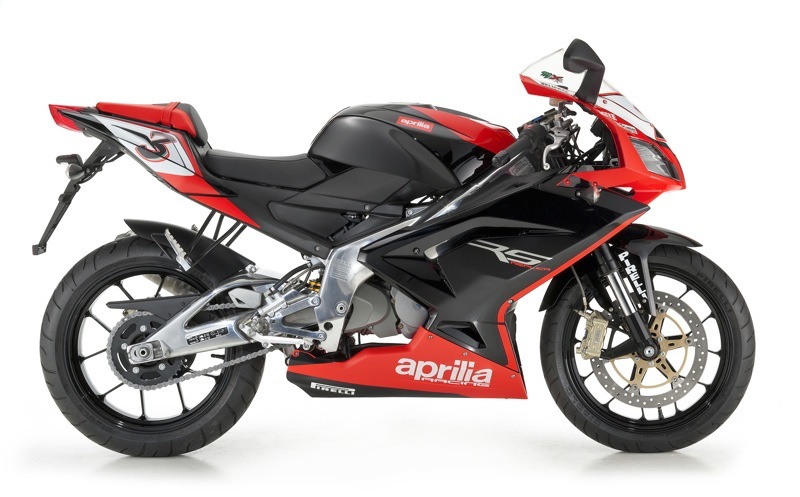 Both models will be available at Aprilia dealers around the country at $8,990.00 plus on road costs for the RS125 SBK Special Edition and $4,290.00 plus on road costs for the SR50R SBK Special Edition. As a special treat for the Australian fans a RS125 SBK Special Edition will be on display on the Aprilia stand at the Australian Motorcycle Grand Prix Expo. So whether you prefer motorcycle or scooter, you too can feel like Max!